What Do You Want To Know About The 'Fastest' Version Of The Four-Door 2018 Mini? This week I’m roaming around in a 2018 Mini John Cooper Works Clubman ALL4 which is a wordy way to say “the performance trim” of what is essentially the Mini sedan, paradoxical though that may be. What do you want to know? I was totally enamored with the BMW-sanctioned Mini redux when it started appearing on American roads right around the same time The Fast And The Furious came out and not too long after VW’s “New Beetle” had everyone nostalgic about pint-sized foreign exchange cars. Those early Minis are still sweet looking to me, though I haven’t heard many good things about their reliability and to be honest, haven’t thought much about the brand since The Italian Job. That’s exactly why I felt like it’d be a good time to revisit Mini and see what the company’s up to and making right now. Its press fleet administrators were kind enough to field my request, and now I’ll be getting familiar with what a Mini is like in 2018. So far, I have travelled around several blocks and I can say that I like the little car’s exhaust note, the interior design is clearly still committed to being cutesy, and it’s nice to see BMW’s beautiful parking cameras in another vehicle. 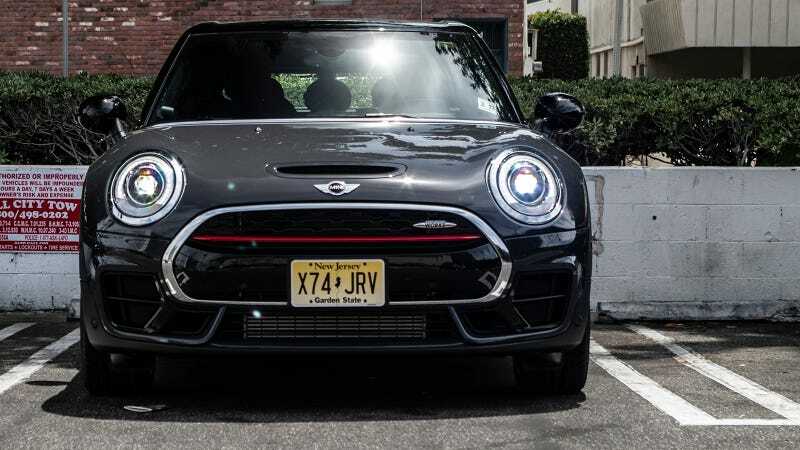 Other than that, all I really know is that this Cooper Clubman runs a 2.0-liter turbocharged four-cylinder engine rated to 228 horsepower and 258 lb-ft of torque, a significant bump from the standard Cooper S’s 189 HP. The John Cooper Works performance trim also apparently unlocks “a track-ready sport suspension” so I guess we’ll have to put it through a Malibu canyon loop to find out what that’s all about. Get your questions in here, and I’ll do my best to answer them in the review you’ll see soon.